The best way to experience anything is from the top. The Pointe, located at the entrance of 30A’s east end, is nothing short of extravagant. 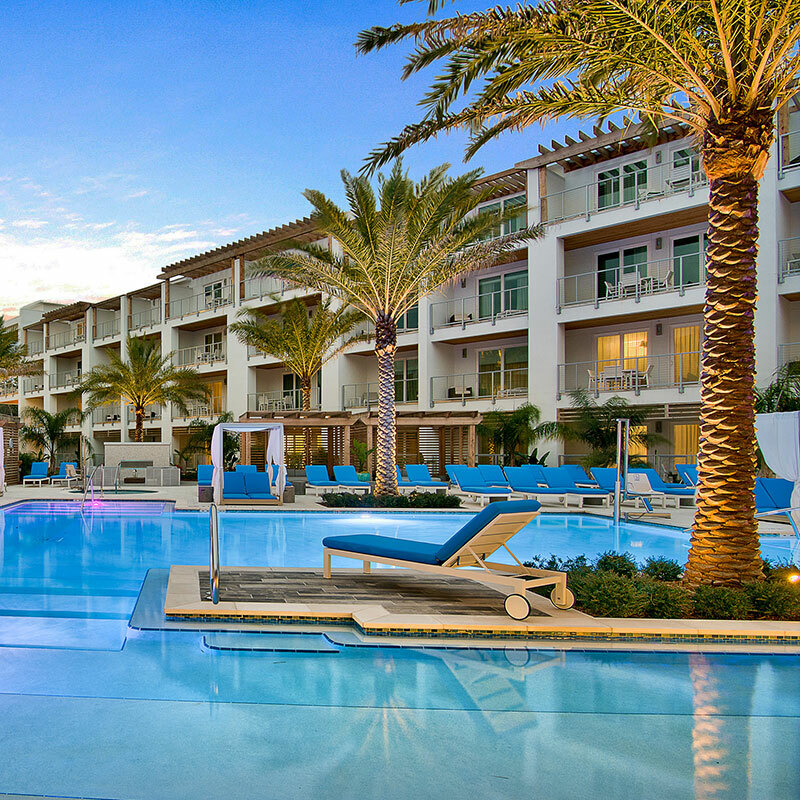 Resting at the center is the more than 61,000-gallon resort-style pool lined with cabanas, a hot tub, a fire pit and amped with modern, upbeat music. Imagine yourself with a tropical drink in hand as a sea breeze cools you from the sunrays you’re basking in by a resort-style pool. The luxury of a plush hotel room awaits you, leaving not a worry in the world. This isn’t a dream ­— the boutique resort, The Pointe, awaits you at the entrance of Scenic Highway 30A’s swanky east end. Redefining luxury, The Pointe’s design and layout boasts an exceptional eye for detail with an over 61,000-gallon resort-style pool lined by cabanas, a hot tub and fire pit. There is no lack in luxurious relaxation; watch the game poolside from the La Cava Lounge or ascend to the rooftop sanctuary to catch a sunset over the Gulf of Mexico. Regardless of where you decide to take haven, the modern and chic white and silver color scheme with dashes of natural wood awaken your senses. The Pointe offers hotel-style rooms along with one-, two- and three-bedroom units with full kitchens featuring countertops constructed from recycled glass bottles, PVC pipe and light bulbs, which make for interesting discussion. Timeless touches like slate grey barn doors dress up the entrances. Some units include sleek fireplaces to cozy up to and private pools for an intimate setting. While there are many unit types to select from, one thing remains constant — a refined, relaxed vibe. Enhance your stay by taking advantage of the many amenities such as beach service, bicycle service, the Pure fitness center and the on-site restaurant, Big Bad Breakfast. Curated for serenity-seeking couples, girlfriend getaways and those who enjoy the finer things in life, The Pointe offers limitless opportunities for larger retreats, events and weddings. Coordinate a private dinner on the rooftop with panoramic views of the ocean or a ceremony on the green with white drapery enveloping your guests, creating your own sanctuary. With the feeling of relaxation taking over, endless amenities for your choosing and the summit of sophisticated style surrounding you, you’ve reached The Pointe. An open floor plan provides ample room to relax and unwind with friends. Modern décor with beach chic touches are present throughout the condominium.